Sometimes I become obsessed with certain foods. Prime example--my mission to find the best chicken wrap in all of the Capital Region. Usually, though, the fixation is of the sweet and sugary variety. That's the case with my latest infatuation--apple cake. 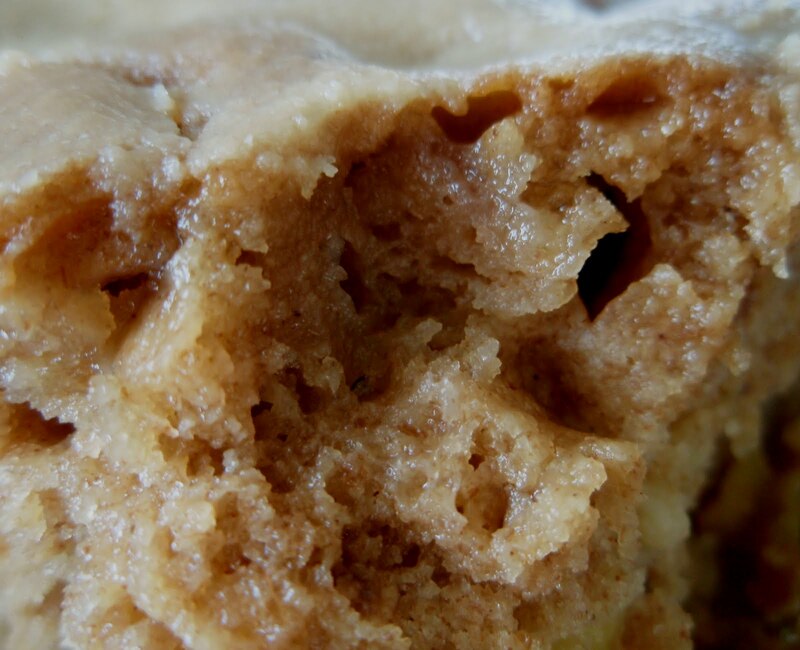 In addition to my beloved apple dapple cake, I’ve recently tried two other recipes with delightful and drool-worthy results. After taking a one-tenth-of-a-second glimpse of Kate’s caramel apple cake, I decided to test it out too. 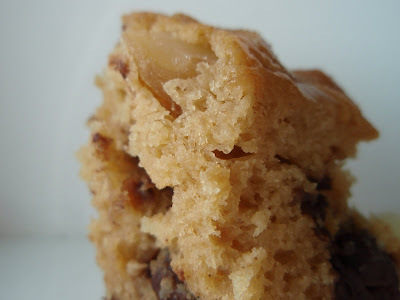 The recipe doesn’t differ much from my apple dapple cake. 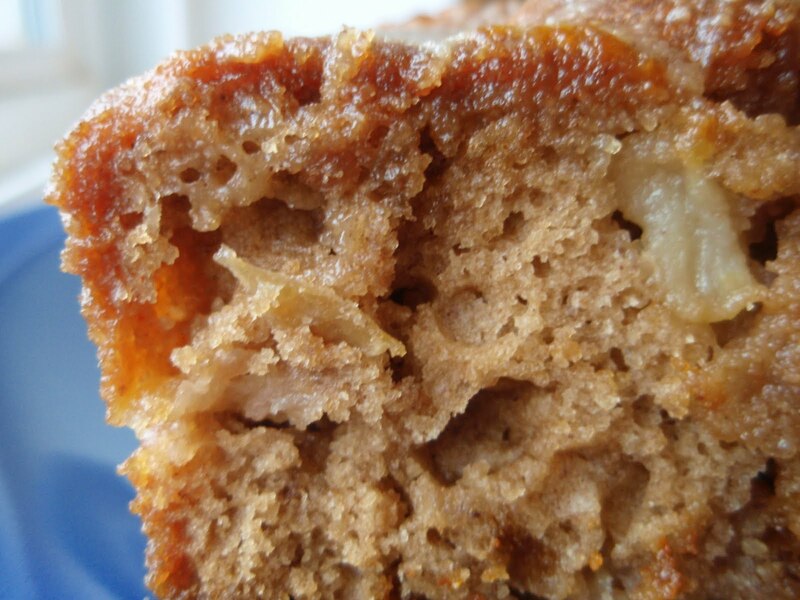 In fact, the only divergence is that a combination of white and brown sugar is used in both the cake and the glaze. 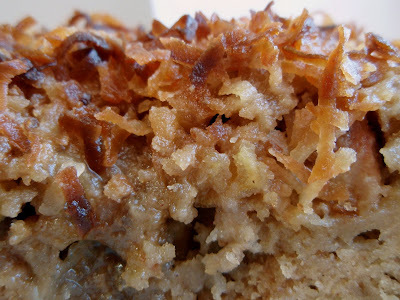 Being a self-proclaimed apple cake connoisseur, I decided to make a few adjustments of my own. I used applesauce in lieu of most of the oil and also added a bit of whole wheat flour in place of some of the all-purpose flour. Now before you get all worked up about me trying to make this more healthy, I guess I should mention another change I made--I doubled the glaze. It’s been well-documented that I have a mean sweet tooth and I make no excuses. I doubled the glaze, dang it, and it was good. I did one other thing about which I'm quite excited--I tossed some marshmallows into the batter. While they completely disappeared into the baked cake, a subtle hint of their flavor (a taste that I find particularly enjoyable) still remained. It's my belief that they dissolved into the cake and migrated upwards, forming a little bit of a crust on top. Yes, I'll be pulling this trick again. 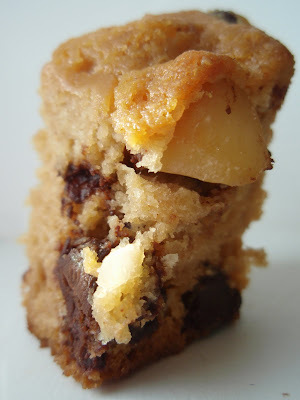 Future apple cakes to try? Lisa's apple and cream cheese cake, Sandie's toffee apple upside-down cake, and Melanie's apple cider pudding cake. Preheat oven to 325F. Butter and flour a 13x9 inch pan. 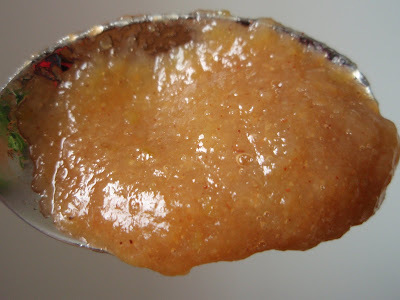 In a medium bowl, beat both sugars, oil, and applesauce until well-blended. Add the eggs one at a time, beating well after each addition. Stir in the vanilla. In a large bowl, sift together flour, baking soda, cinnamon, and salt. Gradually add the sugar mixture until just blended. Fold in the apples and pour the batter into the prepared pan. Bake for 60-75 minutes, or until toothpick inserted in center comes out clean. Cool in the pan whilst making the glaze. To make the glaze, melt the butter in saucepan over low heat. Stir in both sugars and salt and cook over medium low heat for 2 minutes. Add the milk and boil for 5 more minutes, stirring constantly. Poke holes in the cake with a fork or skewer. Pour on the glaze and let set. Certain dishes are worthy of making and eating again and again, and they certainly shouldn't be reserved only for special occasions. 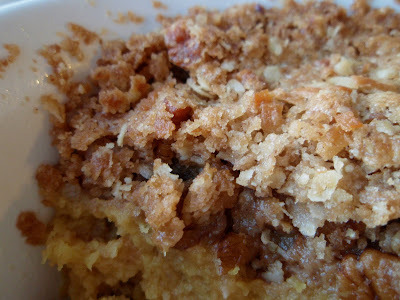 Squash casserole (or its first cousin, sweet potato casserole) is one of those dishes. Yes, I made it last Thanksgiving. Yes, I made it several other times throughout the year. Each time it morphed a little bit more, and I must say, it's come a long way. For our shindig at work this Thanksgiving, I made a denser version and enhanced the streusel topping enhanced with coconut and pecans. The very best part. No debate. The end. Acorn squash was what I had on hand for this, and since it's a good bit more watery than butternut, I added some breadcrumbs into the mix. Heaven forbid I end up with a soupy casserole, am I right? I mean, what if it ruined the topping? We certainly can't have that. Have a filling and fulfilling Thanksgiving, ya'll! Preheat oven to 350F. Combine all the casserole ingredients, beating well. Pour into a lightly greased 2-quart casserole dish. Combine the dry topping ingredients. Cut in the butter with two knives or a pastry cutter until the mixture becomes crumbly. Sprinkle on top of the squash and bake for 1 hour or until the topping is browned and the center is set. All right, I lied. There was a winner of the clash of the cobblers from a while back, but not because of flavor alone. No, I made one of the recipes again (thereby deeming it the winner*) solely because it was easier to throw together. Is that so wrong? Slothdom is a frame of mind that I know all too well, but hey--sloths have to eat too! Tart cherries, soft cake, rich ice cream. 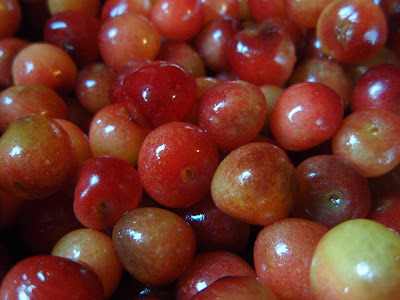 The cherries are a pain to pit, but what a reward for that labor! Yeah, it goes down real nice. *And what a coincidence that it happens to be the recipe from the Pioneer Woman herself, Ree Drummond, who's all over the blog world and America itself these days, on the book tour of my dreams. She seems like such a good egg. ...would rather try to carry ten grocery bags in each hand than make two trips? ...keeps some people’s phone numbers in my phone just so I know not to answer when they call? ...sometimes looks at the clock three consecutive times and still doesn’t know what time it is? ...has no idea how to fold a fitted sheet? ...wonders what would happen if Pinocchio said his nose was about to grow? ...feels a need for a sarcasm font? ...loves the sense of camaraderie when an entire line of cars teams up to prevent a jerk from cutting in at the front? ...wonders how many times it’s appropriate to say “What?” before you just nod and smile because you still didn’t hear what was said? ...hates leaving my house feeling confident and looking good and then not seeing anyone of importance the entire day? That's right--I don't discriminate. Dark, bitter, milk, semi-sweet, white, I'll devour them all. I have my preferences, of course, but who doesn't? Behold, the Leaning Tower of Bread. I know there are some haters out there who strongly feel that white chocolate is inedible and make a big deal about the fact that it's actually not chocolate at all. I ask them, though, does anything pair with macadamia nuts as naturally and as marvelously as chunks of white chocolate? I don't think so. Is white chocolate raspberry cheesecake not a heaven-sent creation? Indeed it is. We mustn't ignore this creamy white confection, regardless of whether or not it's inappropriately-named. Now that I've properly praised white chocolate, I can move on to my latest concoction. I've returned once again to the recipe making use of my sourdough starter and a pudding mix. Past versions have included oreo pudding and oreo bits, coconut cream pudding with macadamia nuts and white chocolate chips, and butterscotch pudding with dried apples. I can't help myself--it's the quickest and easiest way to use a fed Eb and it offers so much in the way of possible combinations. This time, I used some white chocolate pudding mix, macadamia nuts (even though I've already done something similar, I couldn't resist), and chocolate chips (semi-sweet, for the record, and just for the sake of those irrationally against white chocolate consumption). Soft, moist, chocolate-heavy, and with a salty crunch, this bread is everything a breakfast or even dessert loaf should be. Preheat oven to 325F. Grease down whatever molds you intend to use (I filled up 8 mini loaves). In a large bowl, mix the oil, applesauce, eggs, milk, starter, vanilla, and sugar. In a separate bowl, combine the flour, baking powder, cinnamon, salt, baking soda, pudding mix, nuts, and chips. Add this to the liquid mixture and stir thoroughly. Pour the batter into the prepared pans and bake until done. Apparently, this takes at least an hour for regular loaves, and took around 45 minutes for my mini loaves. Cool completely before slicing. Meanwhile, if you're unfamiliar with blonde ducks, you should head on over to A Duck in Her Pond and check it out. Every post written by Miranda (affectionately known as the Blonde Duck) is awesome--she writes amazingly creative stories and displays good eats as far as the eye can see. There's also a little interview with me. How's that for an oxymoron on a Friday morning? There aren't many pairings more traditional than grilled cheese and tomato soup. Having recently made some delectable tomato jam, I decided to combine the two components into one awesome foodstuff. Oh, and if it saves on dish-washing, I'm all for it. 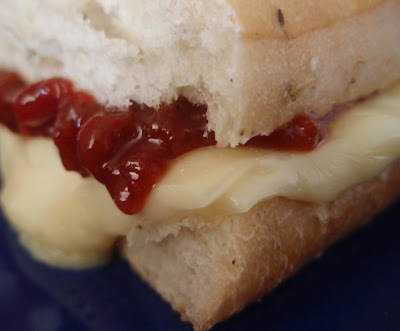 I simply took some rosemary focaccia bread (sadly, not homemade), added a thick layer of pepperjack (the end-all, be-all of cheeses in my book), and slathered on a hearty helping of that vibrant tomato jam. I melted some butter in my cast-iron skillet and grilled both sides until they were crispy-crunchy and nicely browned. It was awesome, an all-in-one delight--sweet, spicy, gooey, crusty, and chewy. Easy to clean up, too. Any other suggestions for ways to use my tomato jam? Do tell! And hey, watch out for black cats and broken mirrors today--it's Friday the 13th! *What?!? I don't get it. I think I'll start saying "acai of my eye" instead, just for kicks. And because it rhymes. I hope I'm never forced to pick my favorite fruit--it'd be way too hard. I love them all, really--bananas for a filling snack, blueberries for an enhanced yogurt-granola experience, dried cranberries for a tart and chewy salad addition, etc, etc. Right now, however, I think I most highly value the apple. 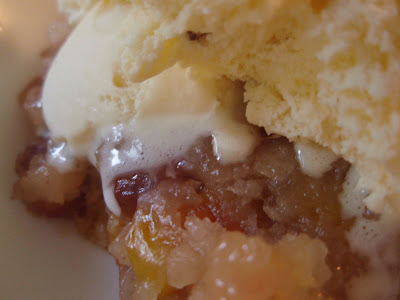 Pies, cobblers, crisps, cakes--is there any fruit dessert for which the apple is not appropriate? I submit that there is not. I've been down the road to Applecakeville once or twice before, but since it's a place I really enjoy visiting, I went back using a different route. How do I describe this cake? Well folks, the air is dry. The skin on my hands is cracking and peeling and screaming for hourly lotion applications. My hair looks like I stuck my finger in an electrical socket. 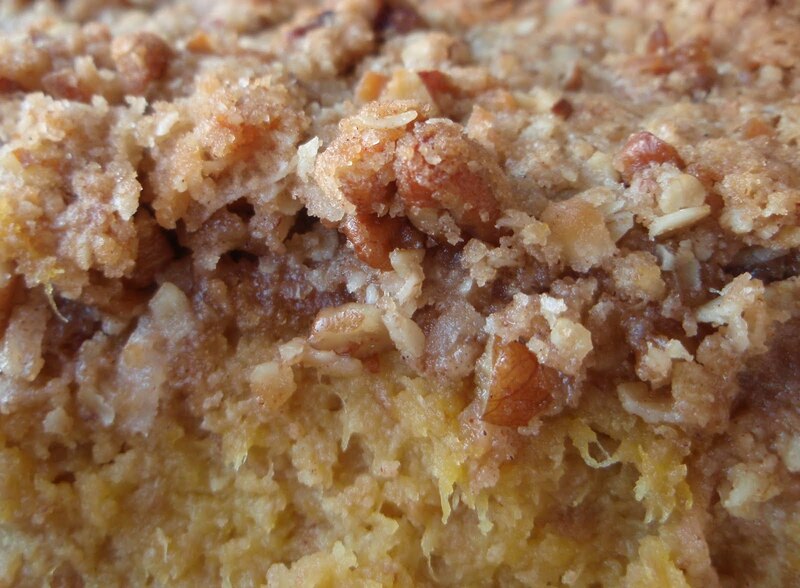 This cake, however, is so incredibly moist that it can easily combat all that desiccation. While the moist-iosity is the defining characteristic of this cake for me, there are other redeeming qualities. The spices are redolent, the apples are softened yet still a tad toothy, the coconut (my addition) is crunchy and flavorful. It has a tender crumb, which is appropriate since I found the base recipe on Linda's awesome blog of the same name. Also, although the original recipe didn't originally call for apple butter**, it was a marvelous and valuable component if I do say so myself. **Incidentally, apple butter is quickly becoming my favorite condiment, approaching and about to overtake pepper jelly. I shall enjoy letting the two fight it out. Preheat oven to 400F degrees. Spray down an 8x8-inch pan. In a medium bowl, whisk together the milk, apple butter, egg, vanilla, and melted butter. In a separate large bowl, blend together the flour, sugar, brown sugar, baking powder, baking soda, cinnamon, salt, and oats to combine thoroughly. Using a large rubber spatula, pour the liquid mixture into the dry ingredients and mix only until combined (less is better). Fold in the diced apples and pour batter into prepared pan. 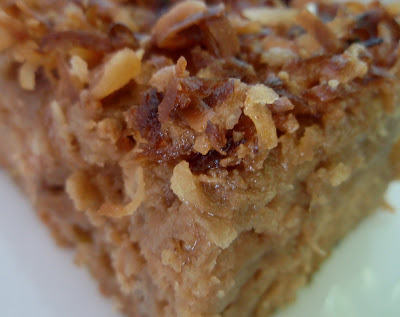 Sprinkle the top with the toasted coconut. Bake for 35-40 minutes, until the cake is golden brown and a knife inserted into the cake center comes out clean. Let cool before cutting into squares, rectangles, circles, or what-have-you. If I start listing off ingredients like maple syrup, cinnamon, and butter, what probably first pops into your mind is pancakes. (Mmm. Pancakes.) That's the case with me, anyway. Those three components could clearly contribute great things to any number of dishes, am I right? This time, I chose to use their magic on butternut squarsh. 1) Wash, peel, deseed, destring-ify, and dice. The peeling is by far the most difficult part, and it's not that bad. 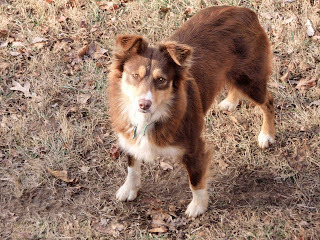 Think of it as a pre-treat workout. Here's a quick tutorial. 2) Evenly coat the diced squarsh with a blessed mixture of melted butter, maple syrup, cinnamon, salt, and pepper to taste. 3) Roast at 350F or so for around 30 minutes, or until the goodies are fork-tender. What a treat this is. Would I rather have pancakes? Maybe. Probably. 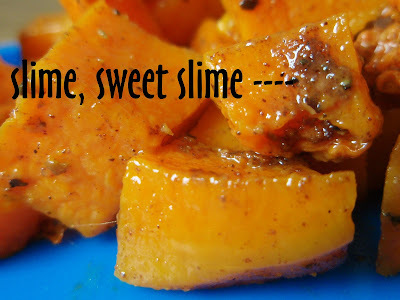 The point is, if you haven't tried this slimy, satisfying, and yes, scrumtrulescent squash preparation, you must do so posthaste! Posthaste, I say! ...except from a vending machine." The proof is in the pudding, or in this case, the gingerbread. If ever there was any question that a person's tastes change over time, I've selflessly stepped up and provided an example of it. Let's wander back to last year, when I made a batch of sourdough ginger gingammonbread. Even with a lovely glaze, I found it difficult to really enjoy. Fast forward to last week and a similar recipe. Wonder of wonders, I liked it, even without a glaze! 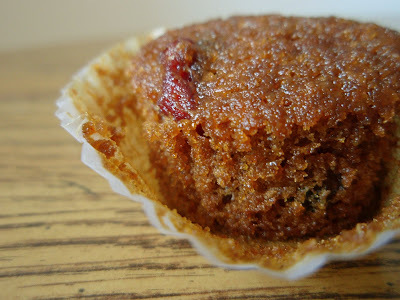 It was moist and fragrant, sweet and a little bit tangy. Granted, a robust cinnamon scent would've been preferred, but hey--a bit of ginger's all right every now and then. Preheat oven to 375F. Line a muffin tin with cups. In a large bowl, cream together the brown sugar and butter. Blend in the molasses and the egg, beating continuously; set aside. In a separate bowl, combine the dry ingredients together and blend into hot water. This will yield a pasty, doughy mixture. Beat this thoroughly into the creamed mixture. Finally, add the sourdough starter slowly, mixing carefully to maintain a bubbly batter. 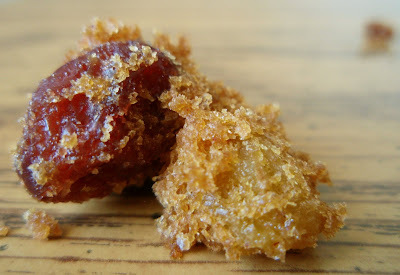 Dust the dried fruit with flour and lightly fold into the batter. 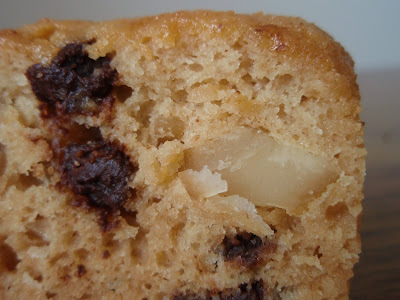 Spoon or pour the mixture into the muffin cups and bake about 20 minutes or until a tester comes out clean.